So this is a non traditional post for my blog but want to help people travelling with their iphone as it took me so long to figure this out and I could not google it. Last year I went to Taiwan and was told by both Apple and Rogers to leave my phone in Airplane mode and I will be able to log into wifi but will not get calls or texts (saving me a massive bill). It was great except I love using my iphone for photos and as a map. When I got home I realized only photos taken in WiFi zones were geotagged to the map and the rest had no info. 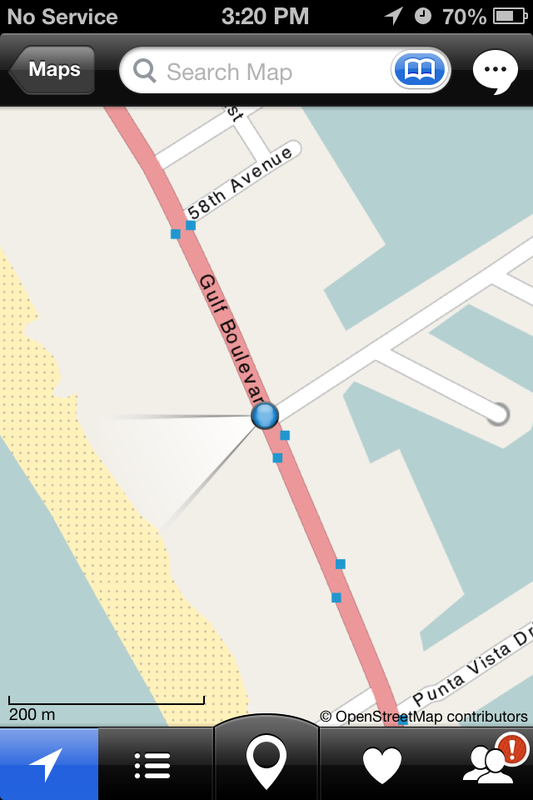 I also used CityMaps2Go (https://itunes.apple.com/ca/app/city-maps-2go-offline-map/id327783342?mt=8) and found I couldn’t navigate without being near Wifi. This allows you to choose which carrier or no carrier. This also leaves your GPS on. So you can have all photos tagged and CityMaps2Go navigation works as long as you download the map of your choice when you find WiFi. Airplane mode is great for on the plane but the issue is it also shuts off the GPS. 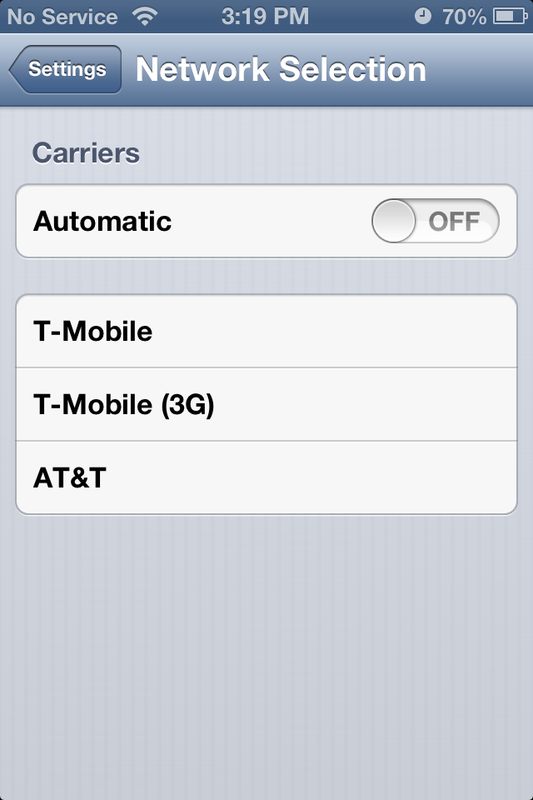 STEP TWO: Turn “Automatic” OFF and do not select one of the carriers shown. Some people said they couldn’t get it to work this way, so an alternative way is to just remove the SIM card! I tried this in Taiwan and worked fine all month! This article has been developed as a collaborative effort between 2 Toronto District School Board (TDSB) teachers/ICT Leaders, who both hold Positions of Responsibility (POR) at their respective schools. The Elementary Panel is represented by Joseph Romano (OCT, BFA Spec. Hons., BEd, MEd), with the Secondary Panel represented by Brandon Zoras (OCT, Hons. BSc, BEd, MEd). Recently, teachers in the East Region (ER14) of the TDSB were given the opportunity to submit proposals for Action Research grants. These proposals allowed teachers to focus on developing a further understanding and research study of something relevant to their teaching and learning practices. This blog post highlights the joint action research study taken on by TDSB teachers Joseph Romano and Brandon Zoras, focused on connecting the TDSB Elementary and Secondary panels through the Science Curriculum and iPads. The TDSB Global Community Education Initiative gives 21st Century learners a community perspective (with Secondary Students acting as advisors/mentors to Elementary School Students) on current world issues (through the linking of TDSB Panels); from Forces to Structures and Mechanisms to more Science Curriculum themes/units, this initiative could allow students to see their place in their own community, within their own school and beyond! In engaging both Elementary and Secondary students through this cross-panel initiative, we assumed that students would be more engaged in curricular content through the use of mobile technologies. Our Findings showed that as this initiative incorporated mobile technologies (such as the MCS 2.0 Laptops and iPads), student engagement rose. Here, a key piece was uncovered. Whereas the MCS 2.0 Laptops allow for an enriched and robust digital creation process, engaging students with the iPads allowed for a much richer experience in not only content creation but also content consumption. With this, the user interface and tactile experience offered by the iPad allowed students to delve “into” the work/content as they swiped and taped through the Science Curriculum. Our classes utilized the iPads for more than just consuming information. We successfully created our own content and published online though the iPad. Students were able to film videos and upload to YouTube, Tweet homework answers to our class Twitter accounts, construct wikis on Wikispaces, and collaborate real time on Google Docs. Video conferencing with Skype and FaceTime was effortless as the iPad is an all in one powerhouse. The iPads were also useful in discovering and learning curriculum content. Students were able to learn through discovery, gaming and manipulation within apps. Below is a list of education-related and Science apps that were useful in this way. Many of the ways teachers learn is through experimentation with new tools and strategies that influence not only their own practices, but also the learning of their students. With a focus on streamlining assessment – specific to the moderated marking practice and critical/authentic feedback to students – I facilitated an EQAO Mock Assessment within the school I work at that piloted the “Crowdmark” web-based application. Overall, Crowdmark allows a teacher (or team of teachers/school team) to generate an assessment, administer the assessment then upload hard copy results to the cloud where student work is churned into digital pieces accessible by anyone on the marking team. Here, a teacher could assess a specific set of students, a specific set of questions, or something in between. Learn more about my experiences in running this EQAO Mock Assessment and piloting Crowdmark by reading “Crowdmark Completes Successful EQAO Demonstration”. Enter the iPad. As we used Crowdmark to assess student work, teachers chose to use their laptops, desktop computers and iPads. As a fully mobile and iPad optimized web app, Crowdmark worked wonders on the iPad as it laid out a grid of each student’s paged response, along with flashing indicators and icons related to the current “status” of assessment (if another teacher on the team was currently assessing the piece). With the native gestures – tap, swipe, pinch and zoom – we could literally “get into” assessing student work, in a way which was unique and innovative. Past it being something new, it was cool – it excited teachers and made them want to continue to use it to assess, literally engaging them in the process one individualized assessment at a time. In the Elementary classroom, we focus much on idea generation and brainstorming as an essential skill in today’s collaborative spaces. Rather than develop static lists using the iPad, we have used the app “Paper” to develop very visual descriptions of abstract and definite ideas and theories. Through Paper, we are able to use our fingers, or even a stylus, to create visual representations of our ideas that we can save locally on the iPad, email to key stakeholders or even share via common social media outlets. Here, we are taking brainstorming and notetaking to the next level by, in a way, crowdsourcing our ideas by asking of others what we have asked of ourselves (through sharing over social media). Students can work with these pieces as references in creating content, and the like after their initial and thoughtful documentation. Supercharging this is the integration of AirServer. As described below, we can focus on sharing our work locally, within the learning space it is physically generated, by displaying our sketched out ideas on the screen for all to interact with. Using “AirServer” along with the iPads led to a rich, interactive classroom experience. The iPads connected wirelessly to my MacBook which was then projected for the class to see. Students were also able to connect their own Apple devices to the screen to share answers as well. “Notability” is one of the best note taking apps I have used for iPad. It’s advantage over its competitors is that it can be used for handwritten and typed notes within the same screen, unlike Evernote which requires Penultimate to do this. The tools are easy to use and allow for clear writing. Organization is simple with folders that can be used for each class you teach. You can important snapshots of sites, PDF, images and insert figures right into the pages. The other major benefit involved the auto-sync to DropBox and Google Drive. This was a huge advantage as the notes would automatically upload to a shared folder the students had access to and could download whatever was done in class. From taking up homework questions, to diagrams and review, no one ever missed a note. We all need a space to drop a note, or quickly jot down a thought. Take that idea and spread it across your classroom, allowing for students and others to engage in the same digital space to offer their input and ideas. “Padlet” (formally known as WallWisher) takes the conventions of the chart paper and extends them to the possibilities of the iPad. Using the iPad, or any other Internet-enabled device, one can punch in a predefined URL to enter an idea sharing space. WIth Padlet, students and teachers can add simple text to a “wall-like” interface (that can be customized with alternate backgrounds and names) or can choose to upload files, include valuable links and even share real-time videos. Using the iPad with Padlet it a joy as you can literally tap an idea anyway and manipulate where it lands on the page. Cycling through others’ thoughts is a breeze through its simple arrow feature, making sharing as quick as a flick! There are also many specific science apps which were beneficial to the students learning and engagement. “Molecules” showed 3D rendering of any molecule. “Cell Imaging HD” showed 3D cells which could be navigated and explored. “Lewis Dots” allowed students to practice Lewis dot diagrams. “Science 360” and “Science House” both offered a large database of science videos. “Nova Elements” contains a beautifully laid out app of the periodic table elements. “Star Map 3D” makes teaching space incredibly engaging with their constellation and star maps. The iPad is a powerful multi-functional tool used in our classrooms. The ability to consume curricular content is great but heavily dependent on the apps available. While the creation of content is far more engaging and easily done from the iPad. The all in one device can record data, photos, sounds, videos and publish them instantly via social media, cloud storage and websites. Being able to introduce assessment for, as and of learning is critical for successful classroom technology integration and was easily achieved with the iPads and the various sites/programs. Having multiple class iPads to a class set would be beneficial but also a bit more of a challenge to manage the images and accounts associated. Apple Configurator allows for mass imaging and backing up of large sets of iPads. The ability to connect classrooms is something we both would like to further explore this coming school year. Contact us via our blogs if you would like to connect and #MakeItHappen. I had the great opportunity to work with Kurt Macintosh of OISE and formally TDSB on a great project using indigenous knowledge. My students had a great time with the project and attached is the lesson plan below. Stories have been passed on from generation to generation through various media. Vocal stories must be passed on while other forms are archived within books, artwork or carved in stone. 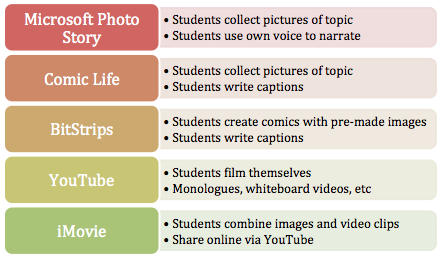 21st century learners have been equipped with the technology to archive stories through a digital format as well as share through social media. This project enables students to summarize the science knowledge they have discovered through the course and mobilize it in a digital form. Students were encouraged to incorporate their own knowledge, culture and ideas in the story and format. They were also told to choose an audience that would benefit from the science knowledge presented. Some students chose to present to Hip Hop culture with whiteboard videos, others filmed in Tamil to address new immigrants regarding medical imaging and what they will expect here in Canada. Some felt comics were the best way to present what they learned and keep it interesting for the audience members and others posted monologues to YouTube.